Dr. Spence is a Professor of Neurology, Dr. Mankoff is a Professor of Radiology, and Mr. Mark Muzi is a Research Scientist, University of Washington School of Medicine, Seattle, WA. 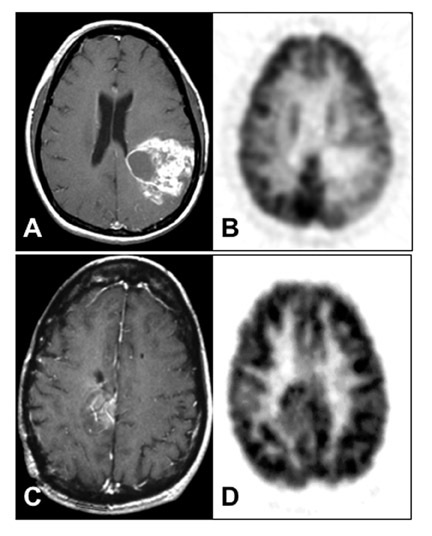 This article reviews clinical positron emission tomographic (PET) imaging of brain tumors, chiefly high- and low-grade gliomas, with emphasis on the use of fluorodeoxyglucose (FDG) for assessing energy metabolism and the use of [C-11]methionine (MET) for assessing amino acid transport. Additional tracers that are potentially applicable in management are briefly discussed. The current standard noninvasive imaging procedures, computed tomography (CT) and magnetic resonance imaging (MRI), provide excellent anatomic precision and sensitivity. Unfortunately, treatment effects (including surgical trauma, corticosteroid-induced reduction of edema and contrast enhancement, and radionecrosis) cannot always be reliably distinguished from tumor response or recurrence. Because surgical tissue sampling in the brain carries significant risks, it is imperative to develop imaging methods that view tumors in their entirety and measure molecular pathologic processes as they progress over time. Positron emission tomography and MR spectroscopy add this capability to our clinical armamentarium. There are several uses for PET: a) Grading tumors and estimating prognosis; b) Detecting tumor recurrence and distinguishing it from radionecrosis; c) Localizing the optimum biopsy site; d) Assessing response to therapy; and e) Defining target volumes for radiotherapy (RT). 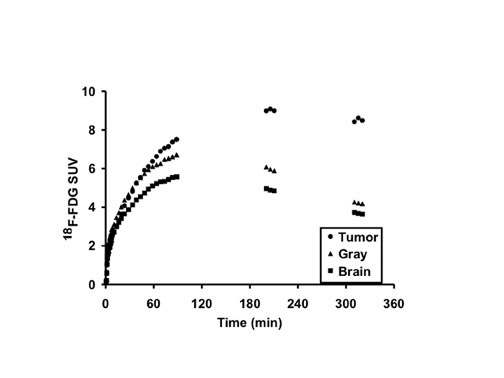 Glucose is the main source of energy in brain tumors 1 ; its metabolism begins with transport from the serum to cells and continues through the process of phosphorylation catalyzed by hexokinase (HK) (Figure 1). 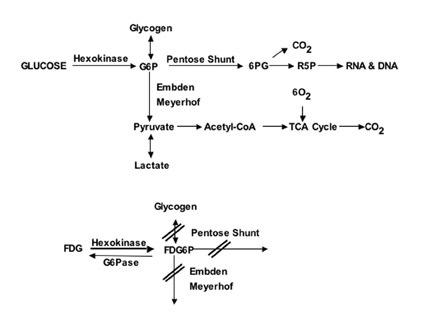 The product, glucose-6-phosphate (G6P), is the starting compound for glycogen synthesis, for the Embden-Meyerhof glycolytic pathway leading to lactate (glycolysis) or pyruvate and entry to the tricarboxylic acid cycle, and for the pentose shunt. The optimal cutoff levels for distinguishing low- from high-grade gliomas have been reported as 0.6 for the T/C ratio and 1.5 for the T/WM ratio. 9 The sensitivity and specificity were 94% and 77%, respectively (Figure 2). In this study, patients were imaged 35 to 50 minutes postinjection. However, tumor/ reference region activity ratios estimated as SUVs steadily increase with time postinjection (Figures 3 and 4). 10 Therefore, the cutoff ratios of Delbeke et al 9 apply only to the imaging times that were used in their report. Similar results, but involving chemotherapy, were reported for patients with recurrent glioblastoma studied with quantitative FDG-PET before and after a single cycle of 1, 3-bis-(2-chloroethyl)-1-nitrosourea (BCNU). 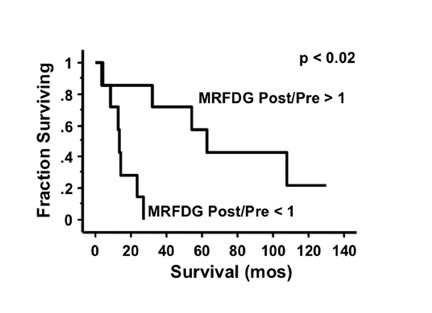 33 Following stereotactic radiosurgery (24 to 32 Gy) in a series of mostly metastatic tumors, Maruyama et al 34 reported that all of the tumors except 1 showed increased uptake of FDG compared with levels that preceded the RT. This correlated with a decrease in the size of the tumors that were seen at later follow-up with CT or MRI. Therapy might lead to increased metabolism and relatively better outcome because of increased transport, infiltration of dead and dying tumor regions with metabolically active inflammatory elements, energy consumption for apoptosis, and/or an uncrowding effect as tumor cells die, allowing more active metabolism in surviving normal elements. 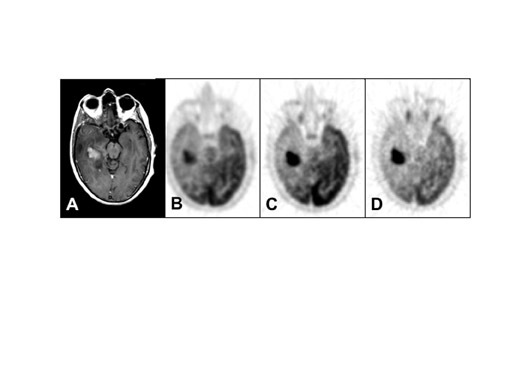 Gross and coworkers 36 incorporated FDG-PET results with MRI for delineation of the 3-dimensional 60 Gy treatment volumes for 18 high-grade gliomas. Their reported median survival of 44 weeks showed no improvement compared with survival rates reported in other studies. They concluded that FDG-PET did not add useful information for conventional treatment planning but suggested that it might prove useful to define a volume of tumor for a boost dose of RT. Such a study, in which FDG-PET was used to define the optimal volume for high-dose boost RT in glioblastoma, was, in fact, under way simultaneously. 37 Patients received 59.4 Gy in 33 fractions of conventional RT, followed by an additional 20 Gy in 10 fractions directed at the FDG-PET-defined volume of hypermetabolism plus a 0.5-cm margin. Although the median survival for the 40 patients in this trial was 70 weeks, this was not better than that of historical controls. Of interest, the FDG-avid volumes were predictive of survival and time to tumor progression in these patients. 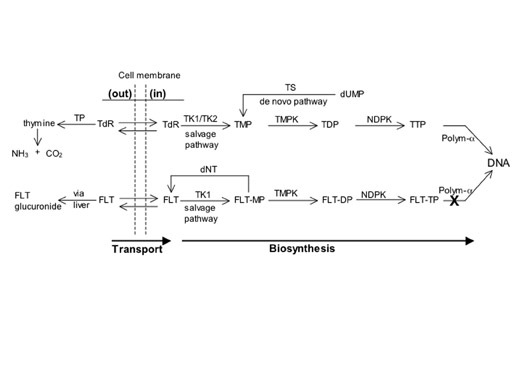 38 This pilot study showed that experimental RT protocols based on PET imaging are feasible and, in the future, could be designed to target regions of hypoxia, proliferation, protein synthesis, or membrane biosynthesis. Other centers are beginning to explore the incorporation of FDG-PET targeting for a simultaneous integrated boost in intensity-modulated RT 39 and for planning radiosurgery target volumes. 40,41 These approaches will, of course, need to demonstrate efficacy before they will be widely applied in clinical practice. In summary, for prognosis and grading preceding initial treatment or at recurrence, FDG-PET is clinically useful in that high uptake signifies more aggressive disease and shorter survival time. This pertains especially to tumors located in areas that are too dangerous for surgical sampling. FDG-PET may be used to direct biopsies to the most metabolically active foci in tumors. For assessing response with pre- to posttreatment comparisons, the usefulness of FDG-PET appears to be limited. 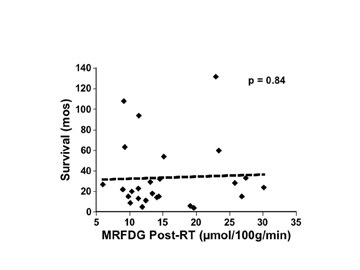 Also, FDG-PET does not appear to be useful for assessing response to RT immediately after the treatment, which is when it would be most helpful to know whether the treatment succeeded or not. The original goal of PET imaging with labeled amino acids was to assess protein synthesis. 42 It is now recognized that the dominant process in the uptake of amino acid tracers is transport via the L system. 43-46 Intracellularly, amino acids for protein synthesis come either from the extracellular pool to which PET tracers contribute or from intracellular recycling of proteins. 47 As a result, PET with amino acids does not assess protein synthesis from endogenous recycling. 48 Depending on the particular amino acid, additional biochemical pathways lead in alternate directions for production of nonprotein biomolecules that cannot be distinguished from protein synthesis with PET. Therefore, estimating protein synthesis rates with PET and amino acid tracers is more complicated than quantification of glucose metabolism with FDG. Compared with MET, studies with the nonmetabolized tyrosine (FET), produce similar results. 53 For this tracer, the sensitivity and specificity are both 88% for detecting glioma in cases suspected of having this pathology based on MR imaging. 49 However, another group has reported that the capacity of FET to distinguish tumor tissue from nontumor tissue is limited. 54 MRI and FET-PET can be used together with neuronavigated biopsies to improve the diagnostic accuracy of suspected gliomas. 51 The sensitivity and specificity of MRI alone were 96% and 53%, respectively, whereas with MRI and FET-PET combined, the results were 93% and 94%. [Fluorine-18]3'deoxy-3'-fluorothymidine is a longer-lived and more convenient alternative that is resistant to degradation, thereby eliminating the background of labeled metabolites in the images. 88-90 Sloan and coworkers 91-93 reported findings in 29 patients with gliomas at presentation or recurrence and found little FLT uptake in normal brain and greater levels of uptake the higher the tumor grade. Uptake in areas of radionecrosis was low. 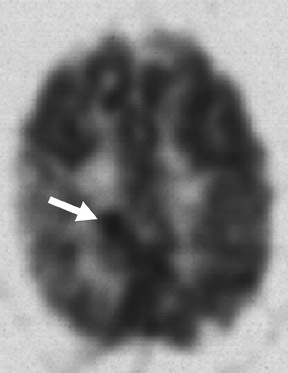 Similar results were recently reported by Choi et al 94 in a heterogeneous group of 26 lesions, but it is noteworthy that they found increased FLT uptake in 1 case each of radionecrosis, subacute infarction, and multiple sclerosis. Compared with FDG, FLT was found by another group to be more sensitive for imaging recurrent high-grade gliomas, proved to be a more powerful predictor of tumor progression and survival, and correlated better with Ki-67 estimates of proliferation. 95 One important common finding in these studies was that tumors lacking contrast enhancement in MRI images did not have detectable uptake of FLT. 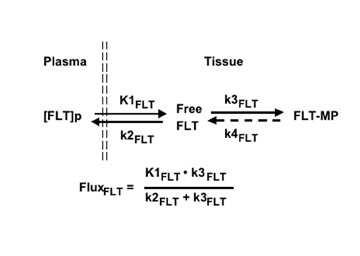 Flux = K FLT = K 1FLT • k 3FLT /(k 2FLT + k 3FLT ). Quantitative imaging based on this model, arterial blood sampling, and simple metabolite analysis provide more information than simple SUV assessment, since transport and flux can be simultaneously estimated. 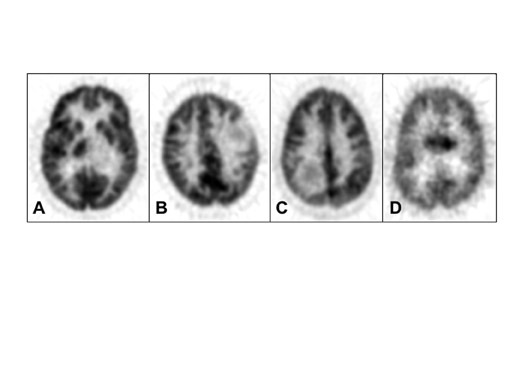 77,96 An example from our preliminary work is illustrated in Figure 97,98 The FLT-PET images clearly show an additional dimension to assessing response to therapy that is achievable by this approach. In agreement with the above studies, we have been unable to show any FLT uptake in the absence of breakdown of the BBB in low-grade gliomas or in regions of high-grade gliomas without BBB breakdown. In all cases, uptake of FLT has been dominated by transport. In several types of cancers, low-oxygen- tension levels are associated with resistance to RT and chemotherapy, persistent tumor following RT, and subsequent development of local recurrences. 99-102 Malignant gliomas often contain regions of hypoxia. 103-105 The tracer [F-18]fluoromisonidazole (FMISO), when used with PET, provides an estimate of the distribution of hypoxia in tumors. 106-109 This tracer is sufficiently lipophilic that it diffuses through cell membranes and is not retained in nonhypoxic tissues, such as the brain. Liu et al 110 reported that FMISO was taken up in 14 of 18 brain tumors and Bruehlmeier et al 111 found increased uptake in 7 of 7 glioblastomas. Another group studied 13 newly diagnosed patients prior to surgery and showed a correlation between FMISO uptake and tumor grade; all high-grade lesions showed uptake that was frequently heterogenous. 112 An example shown in Figure 13 shows the heterogenous uptake of FMISO in a distribution that differs partially from the FDG region in these coregistered images. These studies show significant promise for FMISO-PET in gliomas, but research must be extended to a larger patient population that is examined at additional time points through the clinical course. Identifying the regional distribution of hypoxia may improve planning of resections and allow the targeting of higher doses of RT more precisely to the hypoxic areas. Energy metabolism and amino acid transport are important components of the pathophysiology of brain tumors about which PET provides information that is clinically useful. 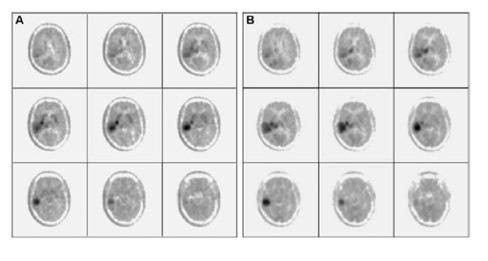 Imaging proliferation with FLT or hypoxia with FMISO is straightforward, although neither tracer has yet been exploited thoroughly enough to allow judgment of the potential benefit to the practice of neuro-oncology. The role of PET in the management of brain tumors. Appl Radiol.